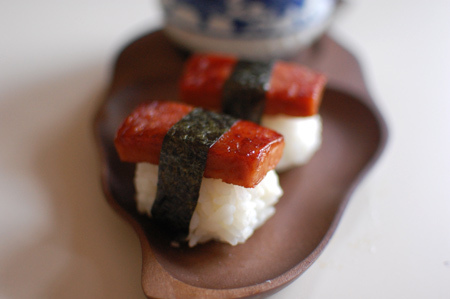 Little onigiri (rice balls) with teriyaki spam. I made them in nigiri-sushi style. To be honest, spam is not my favorite meat. 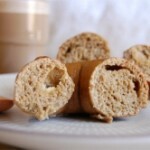 But considering that it is a long-life food and can be always available at the pantry, I’d say it’s very easy snack to prepare anytime you want to eat. 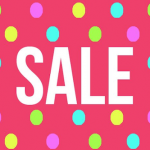 Using spam is cheap too. I’m saying this because it is actually nicer to use ham steak instead of spam. Ham’s got better texture and juiciness (to me). But, ham steak is more expensive than a tin of spam, and again, spam can be available in the pantry anytime. 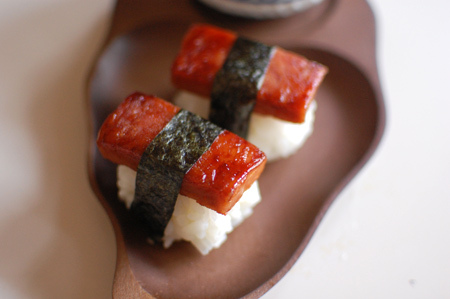 So here is teriyaki spam onigiri. 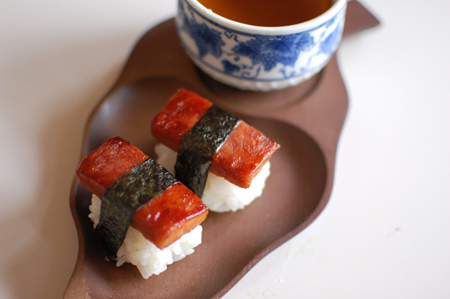 If you like spam then this is a perfect snack for you (?!). 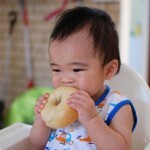 The key is the teriyaki sauce. Caramelize the sauce until spam is shiny! 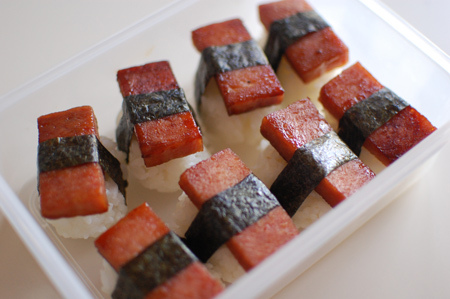 Slice spam into 5mm thick squares. 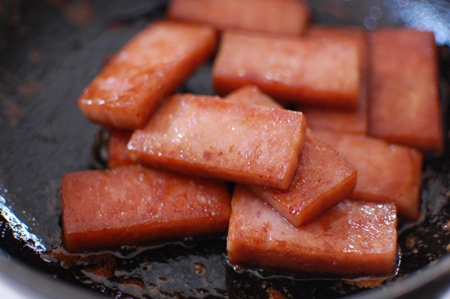 Spray oil in a frying pan, and grill the spam both sides until coloured. Remove excess oil with kitchen paper, if there is any. 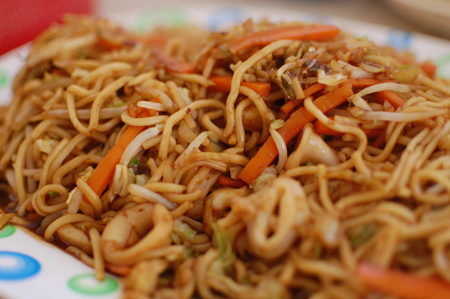 Pour soy sauce & mirin into the pan. Cook over low-medium heat until the sauce thicken and the spam is shiny. 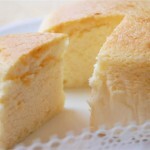 Divide steamed rice into 10 – 12, and shape into flat balls. 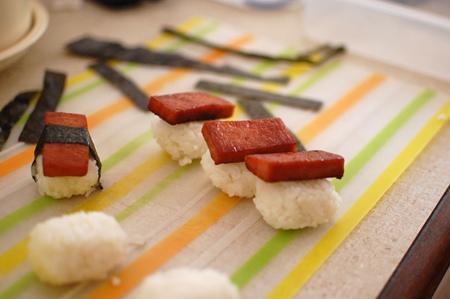 Place spam on top of rice, then decorate with nori sheet. Now they are ready to serve! Onigiri always goes with Japanese tea. 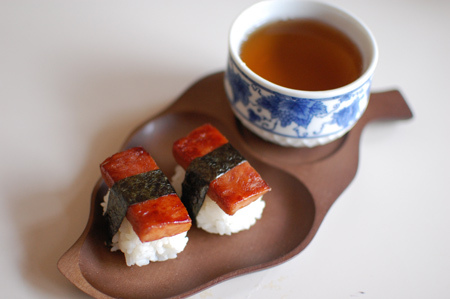 I accompanied my spam onigiri with hot barley tea.